Fullmetal Alchemist Alphonse Elric Armor « Adafruit Industries – Makers, hackers, artists, designers and engineers! 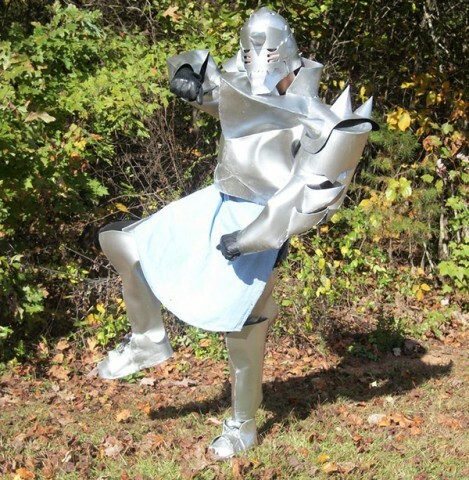 Alphonse Elric of Fullmetal Alchemist may be only a soul bound to steel armor, but you don’t have to go quite as far as he did to make a replica of his suit. Instructables user Tomcat94 spent four months piecing together his Alphonse costume from craft foam. It all started with sketches and cutting out all the pieces – that part alone took three months. He added LEDs to make the eyes in the helmet light up, and he simply used Velcro to attach them. I tested the spraypaint with uncoated craft foam, but soon realized that it wouldn’t put off the same sort of shine as I expected. I looked up some tutorials, and saw someone mention using watered-down tacky glue to seal the craft foam first, so I decided to give it a go. I filled a small container with tacky glue and then added water until it was about the consistency of acrylic paint. I used this to seal the pieces before spraypainting them, which gave the suit an excellent shine.